It’s always nice to be right. 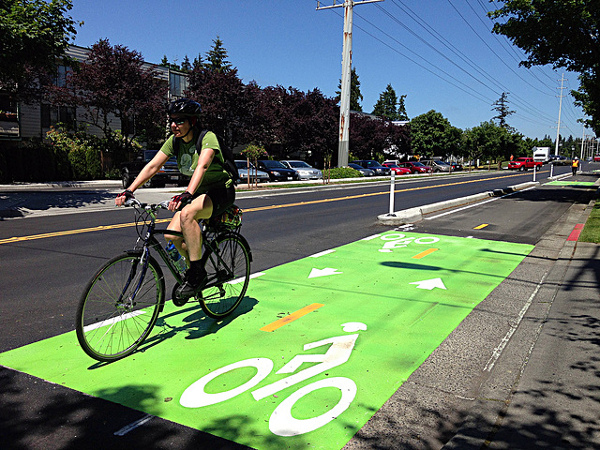 As the thermoplastic dries on this year’s round of terrific protected bike lane projects, we decided to scour the country for a comprehensive (and subjective) ranking of the best of the best. We talked to experts and advocates around the country, looked at technical photos and schemes and read the news reports to understand not just how these bike lanes were designed, but why. Though the word “complete” can be hard to define for something as malleable as a city street, every project on this page has been in some clear sense finished during this year. Chicago’s 1.2-mile showpiece isn’t the country’s most sophisticated downtown bikeway because of its on-street markings, though they’re excellent, or its quick-and-simple plastic-post barriers. The really remarkable thing about Dearborn is that bikes get their own traffic signals. Maybe that’s why stoplight compliance has soared from 31 percent to 81 percent and bike traffic has more than doubled since the lane went in. Did we mention that one of its local fans has given the lane its own Twitter feed? We challenge any other street project in the country to inspire such devotion. 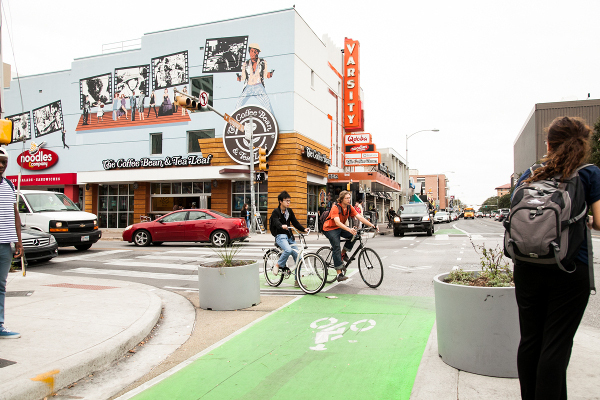 The half-mile spine of Austin’s university district is now one of the country’s best examples of a complete street, with pedestrian-friendly shops, bus stops and a first-rate bike facility that connects to other lanes in an integrated network. In a time when many U.S. cities still ban comfortable biking from busy commercial corridors, Austin is showing why they’re actually a perfect match. They run for just a quarter mile each, but for San Franciscans, these lanes make all the difference for a couplet of much-traveled roads that also serve as crosstown arterials for cars. Removing auto parking here was the key to a low-stress connection between Golden Gate Park and The Wiggle, the old riverbed that is now the city’s most popular east-west bikeway. Plans for more permanent planters are in the works. 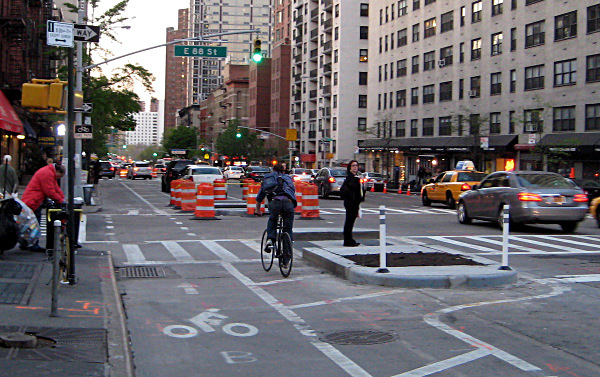 When Mayor Michael Bloomberg tried to reverse course on a plan to add great bike lanes to upper First and Second Avenues, East Harlem didn’t stand for it. “I pay my taxes like everyone else, and we deserve the same treatment north of 96th Street,” resident James Garcia testified. With the help of City Council Member Melissa Mark-Viverito, good sense prevailed. First Avenue now has a protected bike lane from 72nd to 125th Streets. “I’m not only a cyclist but a mom with four kids who all cycle, and also a driver. It makes complete sense,” said Peggy Morales, who chaired the committee that recommended that the lanes replace 166 on-street parking spaces. “We should be able to go cycling without having to take our lives into our own hands.” Yep. 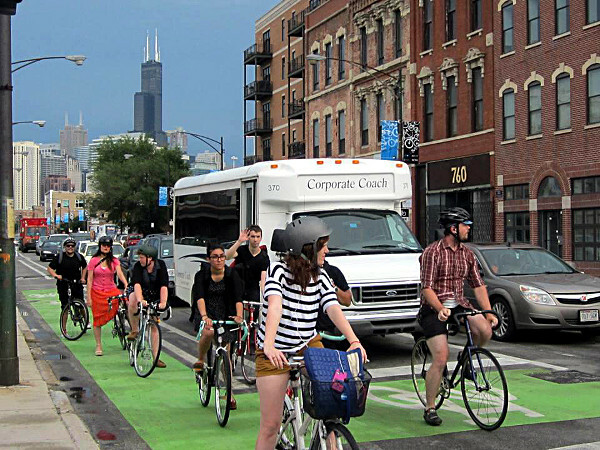 The success of Milwaukee Avenue’s new mile or so of better bike lanes, which combine physically protected lanes with stretches buffered by paint, is a lesson to planners: the best place to put a buffered lane isn’t necessarily where you wish people would pedal, but where they’re already pedaling. It’s the same principle as sidewalks, which are built along desire lines that people naturally carve out. 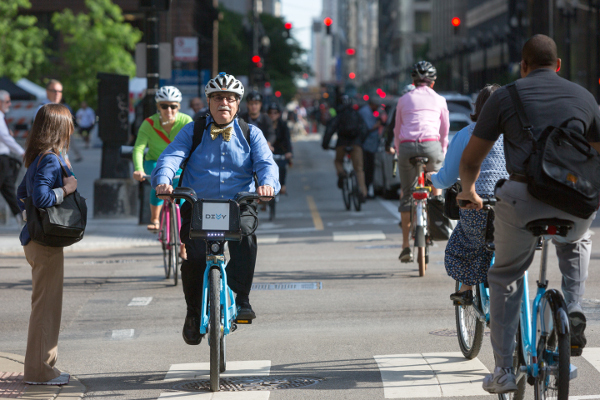 Biking is so important to Milwaukee Avenue that when this project came under fire, three local retail joints on the corridor piped up in its defense. Maybe because it’s been stuck for years in some of the worst traffic in the country, the capital of the New South is turning out to be a fertile ground for big bike improvements. 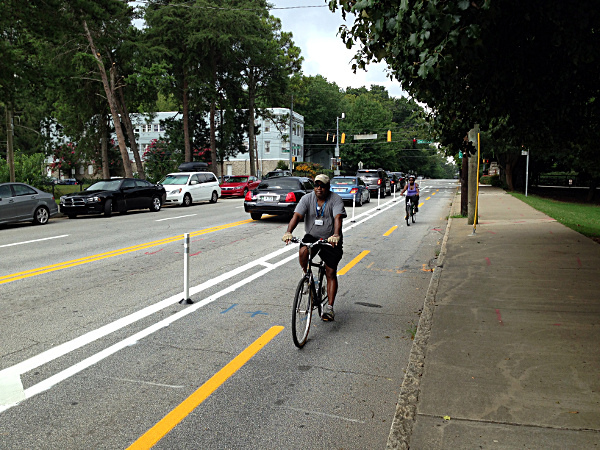 Early this year, Mayor Kasim Reed turned heads around the country by promising to double Atlanta’s bike lanes by 2016. The protected bikeway on 10th Street, which opened a few months later, was the first of its kind in the entire Southeast and promises to be a model for more. 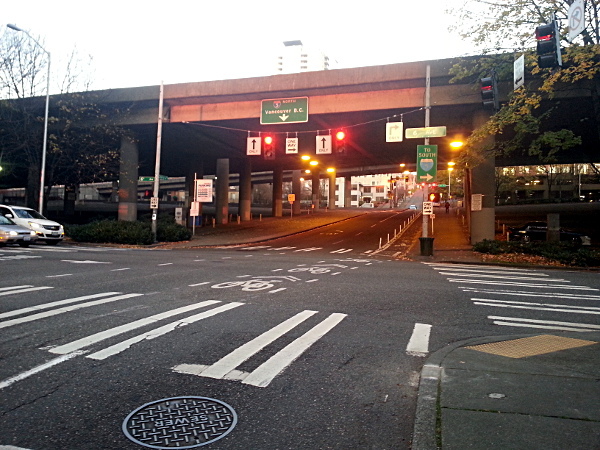 Any other one-block uphill stretch of protected bike lane beneath a highway viaduct, one block from the second-tallest building on the West Coast, would be nothing more than a pretty good idea. But Cherry Street’s protected bike lane makes our list because of who suggested it: a pair of anonymous safety-minded community members calling themselves the “Reasonably Polite Seattlites” who spent $350 of their own money to install these bollards in the dead of night, then sent the city an email to explain why. The coolest thing of all: after removing the temporary installation, city planners realized the activists were right and installed a proper version themselves. Here’s the most remarkable thing about this protected bike lane, Memphis’s first: In 2010, this city didn’t have a single bike lane of any kind. In the three years that followed, this storied city on the Mississippi has made a new name for itself by making advanced bike lanes like this one standard on all new repaving projects of its majestically wide thoroughfares. The first great song about biking in Memphis? Only a matter of time. The Green Lane Project is a PeopleForBikes program that helps U.S. cities build better bike lanes to create low-stress streets. 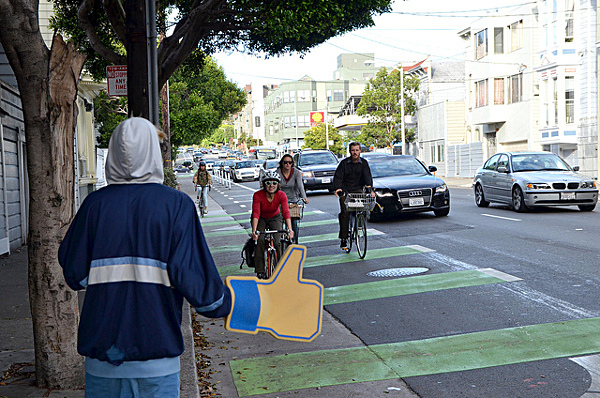 You can follow us on Twitter or Facebook or sign up for our weekly news digest about protected bike lanes. Story tip? Write michael@peopleforbikes.org. Correction: An earlier version of this post confused “avenue” with “street” in Atlanta and New York.